Okay so the last two posts in this series have talk about storing water for three days and enough food for an extra seven days. Now I want to talk about what you'd do to cook that food if your normal means weren't working. Having a secondary cooking source is a really important area of preparedness. 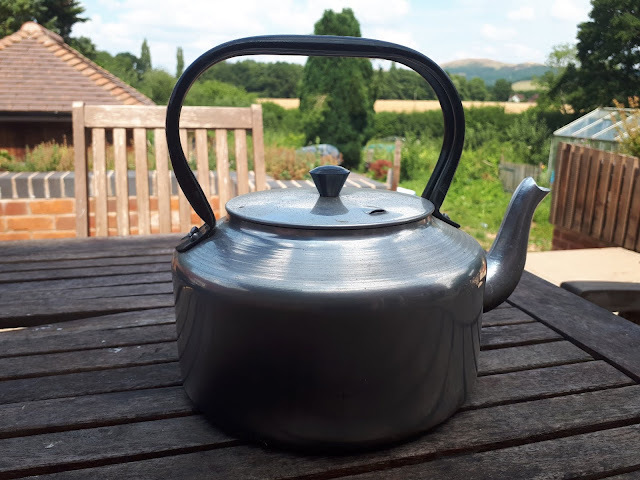 Being able to boil a kettle gives you a great way to make water safe to drink and also being able to heat food is great for making us feel better and making it good to consume. I talked to a few friends after the winter storms we had this year. I was surprised how few had a secondary way of cooking, let alone heating themselves had the power gone out. Many are on gas but lots of modern gas cookers have an electric ignition/fan, etc so won't work without the power (worth testing if in doubt). Living where we do, many have the option of using wood or coal burning stove or Aga to provide heat and to cook on. This is the perfect solution in winter. Great to have a kettle always on the boil and food can be left cooking slowly all day. I plan to have another wood burning oven in our new kitchen, which will mean that I can still bake bread and cook like I normally do in an oven without power rather than just using the stove top. 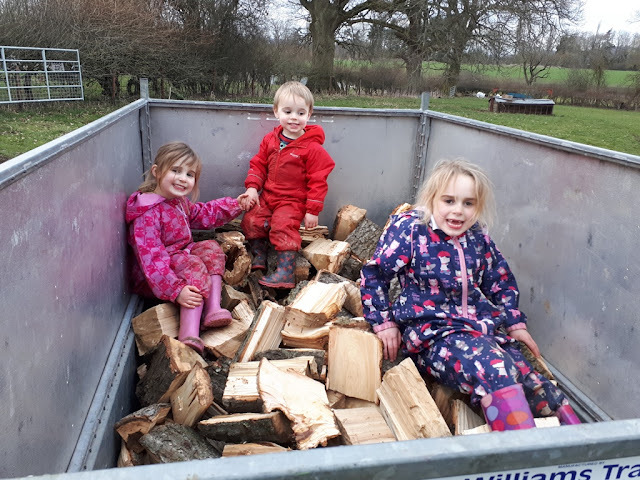 Using wood or coal means you have to keep a good stock of fuel and have easy access to it. It's also not ideal in the middle of summer! No way would I want to light our wood burner at the moment, we'd be cooking alongside our food! When we visited Blists Hill earlier in the year on a hot day, the kitchens where they were cooking were unbearably hot and I couldn't stand them for more than a few minutes! 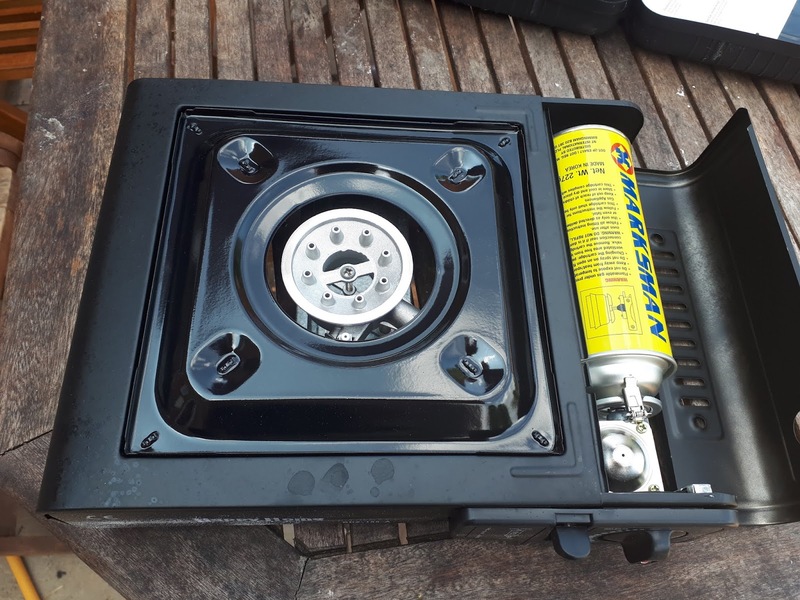 My first option for a back up way of cooking would be a simple and cheap gas camping stove. There are many on the market so a lot of it is down to personal preference. Be warned though you shouldn't really use these inside though. If you do make sure windows are open and you have a carbon monoxide monitor fitted. I have two camping stoves that I use frequently. The first is the type you can buy from most discount stores and comes in a little black suitcase. 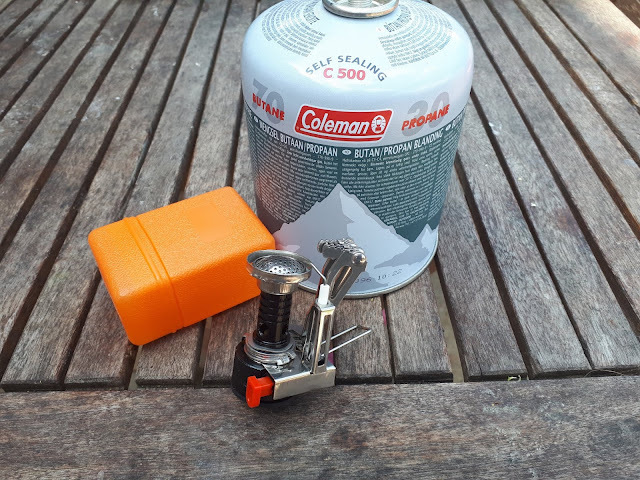 These are great as they're quite large so nice and stable (I even used the canner on mine not so long ago), the suitcase can also be used as a handy windshield should you need it. They use cans of butane that are cheap and seem to last a long time. I think the stove I've got was about £10 and the gas is about £10 for four canisters. 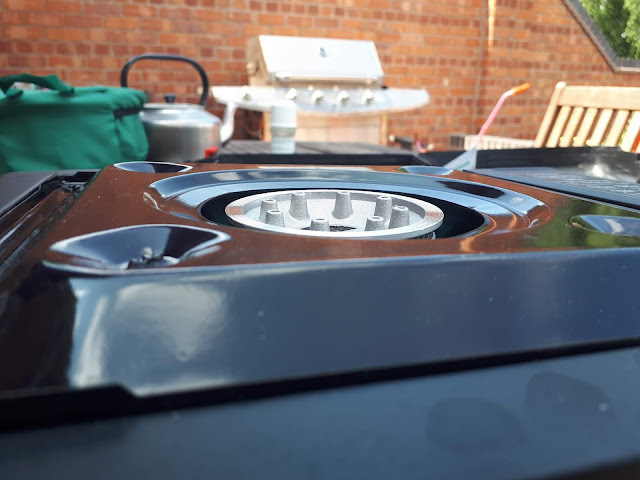 The second is a much smaller stove, so far better suited to wild camping or if you were packing a bug out bag as it folds down to nearly nothing. This type of stove is far less stable so needs to be on a flat surface if possible. The gas bottles come in many sizes so great to have a small one if space in a pack is an issue. They all reseal themselves so the stove top can be removed as many times as needed. This set up is around the same money. 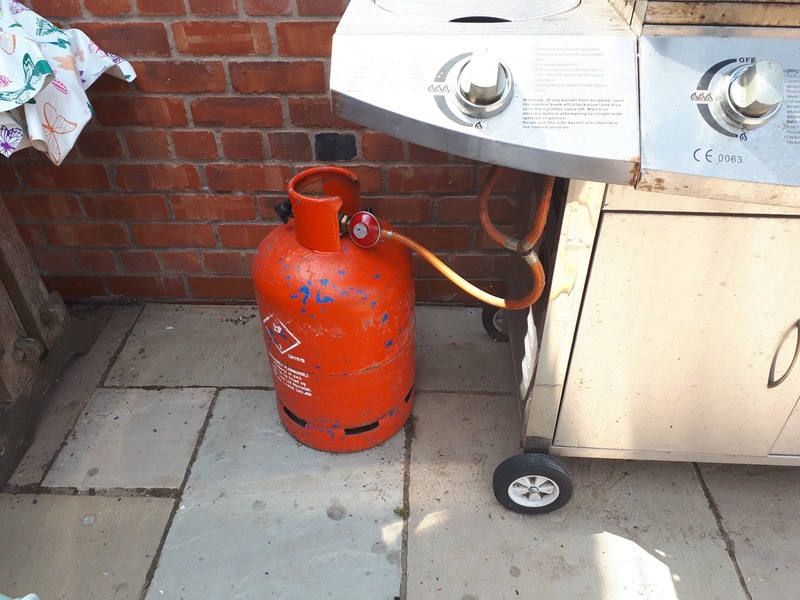 About £8 for the burner and the gas bottles are anywhere fro £3 for a smaller one to about £6 for the larger. Another more common option most people have is a BBQ. There are many options on this as well! Lots have a charcoal BBQ, these are great to cook on (so much flavour!) but they do use a fair bit of charcoal (although you can burn wood on them) and take a bit of timing to use them right. Charcoal can be made at home although it's not easy, so a good stock of charcoal should be kept if this is your backup. Under no circumstances use a charcoal BBQ inside though! 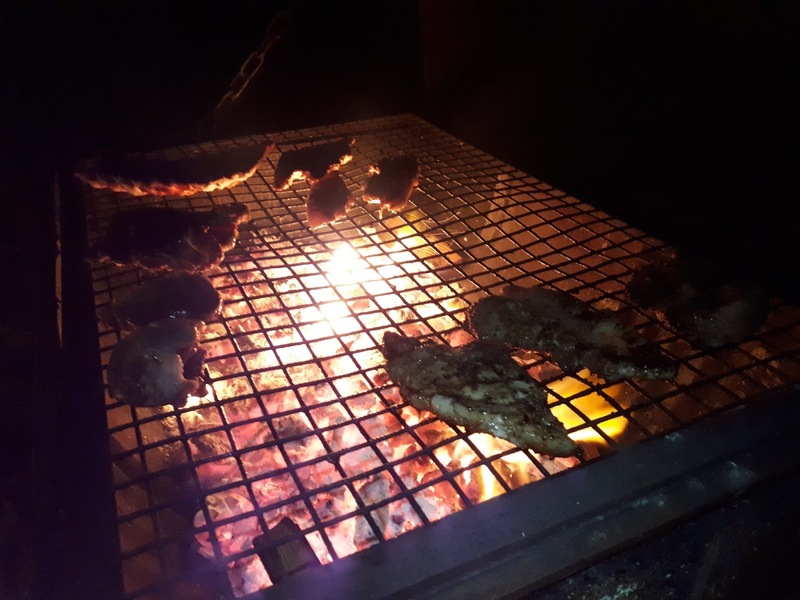 We used to burn oak at work to create a BBQ, takes a little longer but still works well, we normally did it between two concrete blocks with a bit of wire on top. A gas BBQ is by far an easier option. I use ours all the time as it's like having a kitchen outside, it even has a hob on the side so a frying pan or saucepan can be used at the same time. 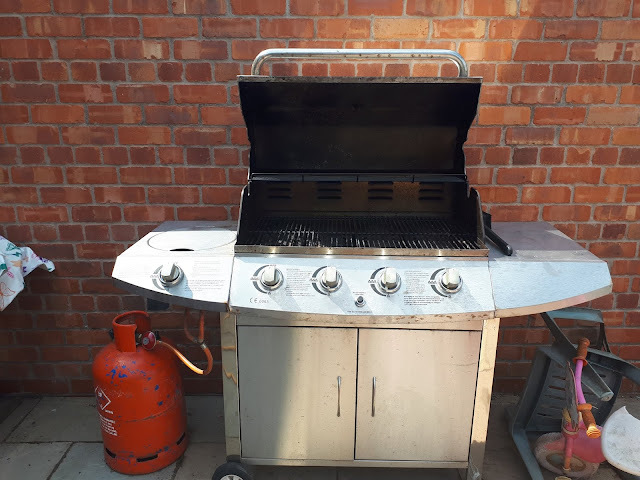 You can spend anytime from £50 to a huge amount on a gas BBQ and the gas will set you back about £35 fr a bottle shown above. That normally lasts us all summer though so having one spare would easily see you through any power outage we see in this country. A simple low budget option would be to enough loose bricks to make a quick rocket type stove should you need to. The one pictured above took about 10 minutes to knock up and light. Within another 5 minutes we had a kettle boiling using nothing but small sticks and off cuts. 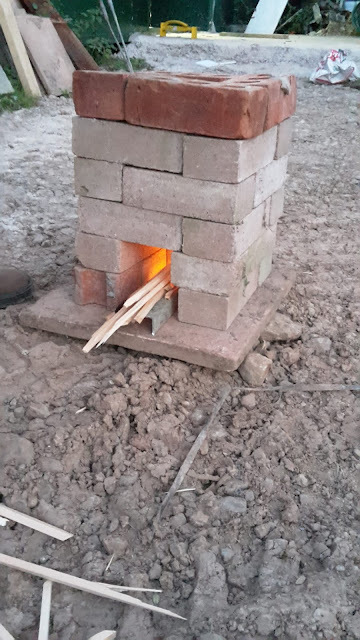 The principle is easy, it's just a chimney with a hole in one side for the fuel to go in and a way for the air to draw under and through the fire (we used a bit of metal channel). The beauty of this method is how little fuel it uses to heat a kettle or a pan, far more efficient than an open fire. Cooking on an open fire - lovely but not the best use of firewood! I should also mention about what cooking utensils to use if you are using some of these methods to cook. If your fuel is in short supply or you're trying to make it last then using cast iron pans that take ages to heat up might not be the best idea. 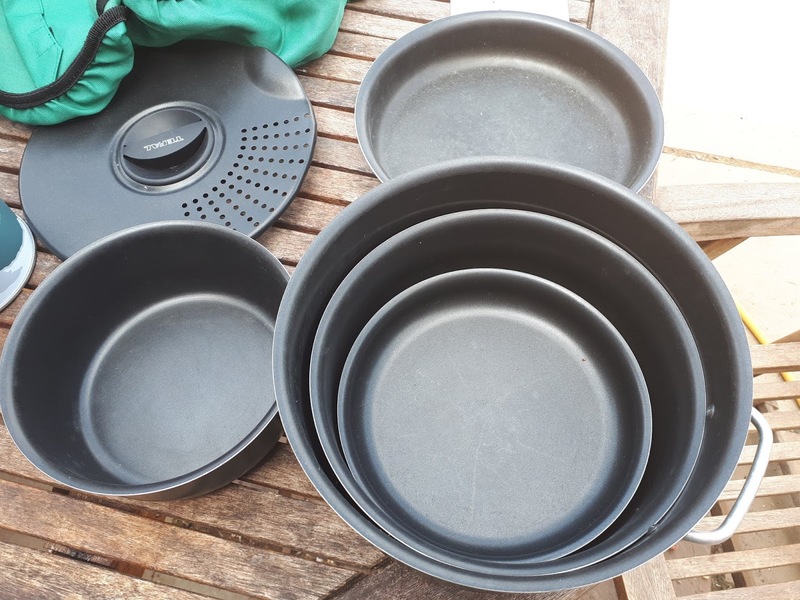 We have some cheap thin bottomed camping pans and kettles that are ideal, as are army mess tins or billy cans. You do need to be more attentive when cooking so they don't catch and burn the food. Doing simple things like putting a lid on the saucepan to heat it up faster or making sure you don't cook things for longer than they need all help to save fuel as well. This isn't supposed to be a comprehensive list of off grid cooking methods, there are many more out there. 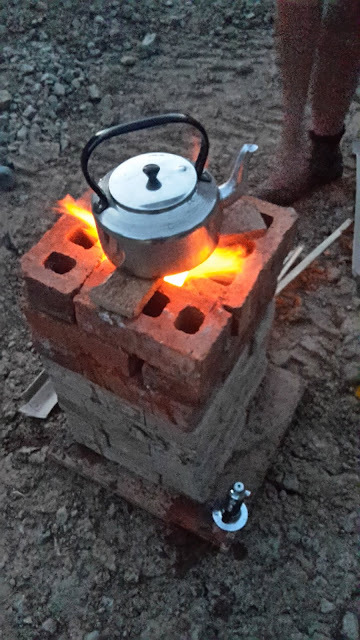 Things like a Ghilli kettle or hexiblock burners, hundreds of different types of stoves and rockets stoves are out there as well and many that use other sources of fuel. A generator would also be another really useful solution. Hopefully this post has made you think about what you'd use if the power went off for any length of time or your primary method of cooking food was compromised for whatever reason. So do you have a secondary means of cooking? How long could you use it for? Would having some extra fuel be helpful? Good article Kev! We have both a wood fired oven, and a wood burner for heating. The oven does what it says; and apart from heating our sitting room, our wood burner both cooks perfect baked spuds in the ash tray area, and slow cooks casseroles on the top. 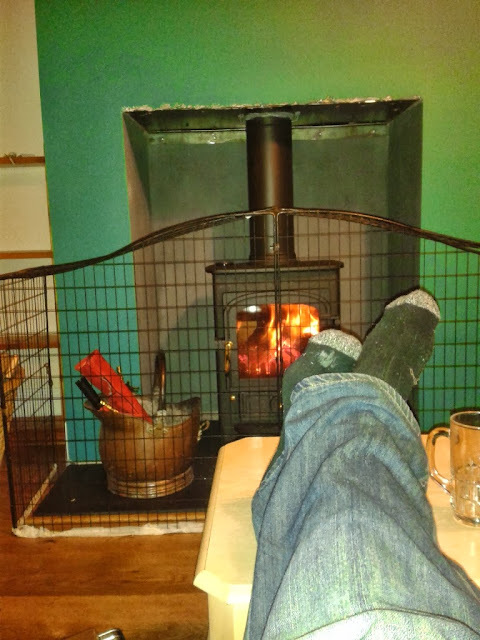 It is worth adding that when installing a wood burner, it is best to connect the pipe to the back rather than the top (if there's an option), this way it gives a good hot-plate on which to cook. It also means that the wood burner will be positioned further forward, which is better for heat. That is a good point. Ours goes out the top just because our rooms aren't that big and this way it saves a bit of space. We have an eco fan on ours that blows the heat around the house a bit more. We don t currently cook on ours very much as the children have been so young and we'd have to carry tings over their heads. With the new kitchen though I'm really looking forward to having an oven I can cook in! We have an Esse Ironheart and it is amazing to cook on. Everyone comments on how much nicer the meat is. Oh, just googled it and that is a lovely oven. I haven't got the space for one of those in my new fireplace unfortunatly. The one I'm thinking of getting is called the bakers oven and it's an Australian made one with the oven on the bottom. We have an Esse Ironheart and it is amazing to cook on. Everyone says how good the roasts are from it. 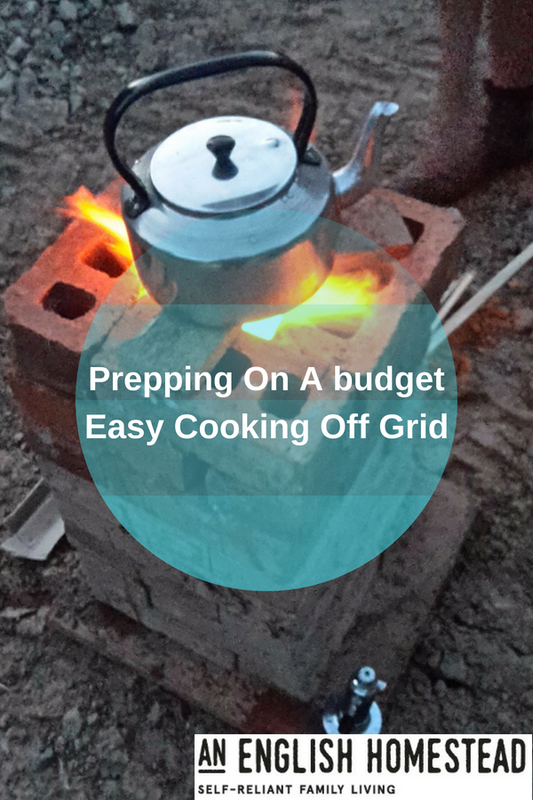 We have the little camping stove in the suitcase like yours, I used it quite a bit last winter as our electric is always going off, a pressure cooker is handy here to save on gas as well. We also have an open fire in the living room, not much good for cooking on but good to heat one room. Great article Kev! Yeah, open fires can be cooked on but takes a bit of practice! Like cro says, cooking in the embers is the way fo4ward I think, or wrap a jacket potato in tin foil and cook it that way. We used to do that on bonfire night! I've not cooked with a pressure cooker, dawn also rates hers highly so maybe it's something I need to look at getting. I'd like to make up a hay box to keep things cooking for longer without power as well! I love my little Korean type propane cartridge stove, quick simple and very stable as you mention. And for 18$ at Walmart they are cheap enough. I have found the cartridges are far cheaper when bought at the local Asian supermarket. About a dollar and a half per can as opposed to four dollars at the department store. But a proper liquid fuel stove gives you an additional option when you run out of propane canisters. Most will run on regular car gas. Here is part of my arsenal. A liquid fuel one would be a great addition and something I'll look to add next as another backup. I bet a jerry can would last a long time! I do like those little gas ones, ideal for camping or a picnic and cheap enough to keep plenty in store. We had a power failure last night, thunder storm was wreaking havoc and a bigger distribution transformer station was flooded (more than 10 miles away). Kids were disappointed 'cos they had just time to light candles and then lights came back. I've seen them but never used one. Be great to try one out and add it to my kit. Not sure what proof alcol you need, I don't really keep spirits as I'm not a big drinker! We use do love power cuts with candles and board games ! A future post might be on making a blackout box. Those little Trangias use denatured alcohol, not the sort of alcohol you drink, but the sort you buy in the hardware store. You can also use products like Heet or other automotive fuel additives intended to remove water from your fuel tank. They work quite well though they have to be well protected from the wind and are a bit slow to bring a cup to boil. I think I have something similar for a Fondo set we have, it burns Methelated spirits which I think is what you guys call denatured alcohol! Yeah it's slow to cook things but would work in a pinch. Mine is only tiny though - just enough to heat some cheese! Yes, they use meths. They're good- with a bit of practice you can stack pots on it so you're cooking and heating at the same time. They're used a lot on D of E expeditions. I might have to get a proper one then! Always good to have lots of options! Great post! Spent two weeks with no power after Hurricane Irma. Rolled Bar B Q to west side of house in AM, east side in PM for shade. Used generators to keep freezer and frig cold and pump water. Needed lots of gasoline (also for chain saws to clear road out). Remember groceries, restaurants, gas stations, roads closed. Everything sold out or ruined in freezers. No ice, and sewage backing up due to pump stations down. Traffic lights, phone lines and communications down. Our Governor was super--put armed guards on tanker trucks to get emergency gas thru but never enough. Water lines broken by uprooted trees. Have extra chains and spark plugs for chainsaws as well as batteries for flash lights and radios, plumbing fittings and glue. Peanut butter and jelly sandwiches, mosquitoes, fire ants, and cold showers. Everyone pulled together and we made it through. A new generator is very high on my list. I have lots of meat stored normally and it would be a shame to waste it! An extra chain for the s2 is a great idea. I always sharpen mine but a spare would be sensible - on fact I can't believe I haven't got one! Thanks! In the summer, we like to use our solar oven. It heats to about 250-325. I liked my first one so much I bought a second. It’s been a great way to make bread when I don’t want to heat up the house. I'm going to try and make one next year I've decided, they sound great and I love the idea of cooking outside in the summer like that! I'm going to look at the oven on Tuesday I think so I'll let you know the oven when ove been to see it (just in case it's rubbish!). Having two wood burners means we should be able to heat off wood mainly should we want to. High effiecency is essential to save on fuel as well! Hi just wondering if the stove/oven was any good? What a great series Kev. And such a sensible approach to prepping. So many books and blogs talk about years worth or more of prepping, but that can seem really overwhelming. In summer we love to cook on the grill. That's Dan's domain actually, and we have so many trees that we gave up on charcoal a long time ago. He's experimented and knows what kinds of wood give the best flavors. I like my solar oven in summer as it keeps the heat out of the house! In winter I love my wood cookstove, but have to admit I've wished they sold Agas over here. Seems like an excellent addition to a kitchen. Thanks Leigh! It ink that's what puts so many people off. I'm trying to come at it from a point of view that the world isn't going to end but it's still worth being prepared for bumps in the road and it's not that hard or expensive to do. We used to cook at work over oak off cuts - just as good as charcoal when it burnt down (we'd light it early). You guys have soem great stoves over there. The one I'm looking at buying comes from Australia. I'm going to go see it Tuesday hopefully and see what I think. Husband and I have a background in Scouting and Guiding, I'm all for prepping and he likes 'kit' so we're sorted on this one! We have a wood fired Rayburn in the kitchen which I love. I was left some money by my Godmother and we bought a refurbished one. There's a woodburner in the living room but we haven't done much more than reheat casseroles and toast crumpets on it. I have a storm kettle (mine's the Eydon but it's the same as the Kelly and Ghillie kettles) with the pan set- I've cooked breakfast for 4 on it!- and a bigger rocket stove. 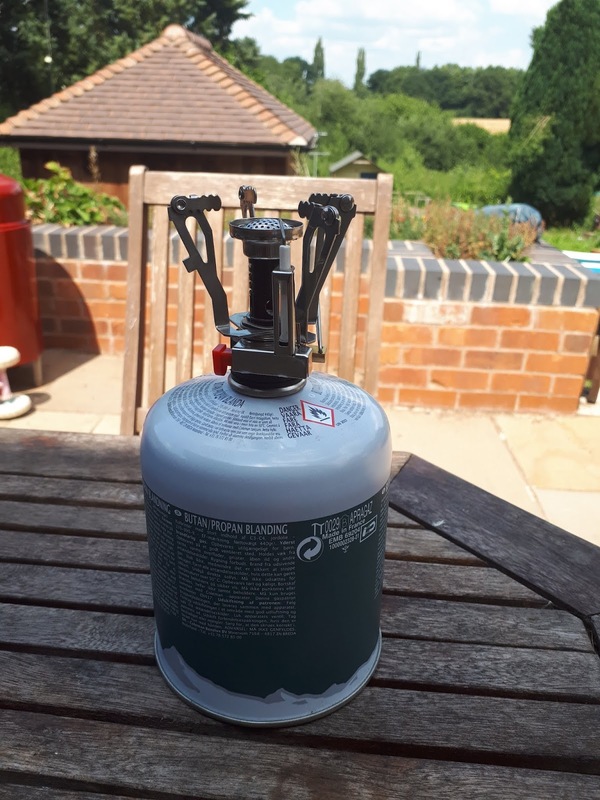 We have one of those butane stoves we used to keep in our allotment shed and is good if you want to take it on a picnic where using the storm kettle will be difficult. 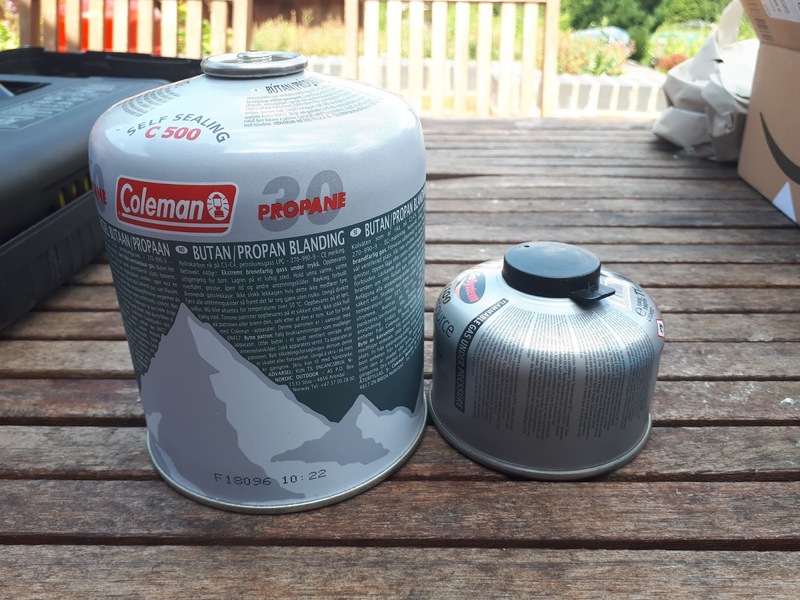 I'm pretty sure we have a little gas stove from husband's mountaineering days and we have a trangia and meths and even a couple of those tiny solid fuel stoves in bags in the car for dire emergencies although I've never actually used them. I probably ought to try. A bit like using and rotating your food and water stocks I think cooking on alternative food sources is something people should practice regularly. 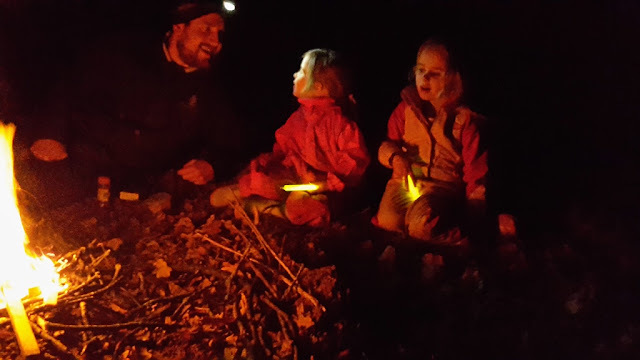 Most of them have a knack and you don't want to be learning it when it's cold, dark and you have hungry children (or adults) wanting some food. My daughters are at Guide camp this week where they cook and heat water entirely on fallen wood. I think it's such a useful skill to learn. I think we're all pyromaniacs at heart! I'd love a storm kettle, but then again I don't drink many hot drinks. Brought my brother one years ago as a present. Keeping skills alive is hard and making sure you practice is key - I remember getting our log burner here and I suddenly realised I wasn't that good at lighting a fire! It was like I'd wasted my youth! :-)) making up for lost time is good! Would you drInk enough of your dehydrated soup to justify a storm kettle?!! If I have to start justifying all my purchases I'm in trouble! To be honest probably not as I'm normally at home so have other means of doing it. I've been working away less and less and when I do it's only a few miles from home. We had a BBQ on the beach last year but all the sausages kept rolling off!